DIY pearl chain necklace | Greetings craft addicts of all ages and persuasions, and welcome to another exciting edition of the Craftcorners blog. Today we’re going to be taking a look at yet another exciting do it yourself jewelry project. We really love the idea of homemade jewelry because this stuff transcends the simple idea of a homemade project, allowing you to share what you’ve made with others simply by displaying it on your person. Today’s craft is a bit more meticulous than some of our other jewelry based projects, and so is probably more suitable to an older or more advanced crowd. Let’s get started! A chain you’d like to wear. Chain linking tool – sometimes you can find these as part of sewless fleece square blanket kits. You’ll want to start things off by ensuring that the chain you’ve chosen can actually fit around your head – if not, get a bigger chain! From there you’re going to take your chain link attachments and space them out evenly along your chain – the chain linking tool will most definitely be necessary here. Once you’ve got your attachments all set up, it’s time to address the silk ribbons and pearls. 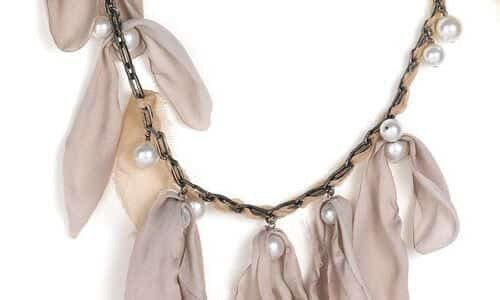 Using your linking tool, loop the small pieces of silk ribbon through the pre-fitted hooks on your pearls. This part can feel a bit tedious but the results are well worth it. Ensure that the ribbons are small enough to actually be a part of your necklace, it’s very easy to over-estimate here. Now that you’ve got your ribbons attached, it’s time to start the work of attaching your pearls to the pre-spaced links you’ve set up earlier. The linking tool will come in handy here as well. Voila! You’ve got a gorgeous necklace to show off at your next soiree. Decorate your own wine glasses for any event!